A spacecraft ID plate from the Apollo lunar module "Eagle" led the sale of the Armstrong Family Auction with a sale price of $468,500 at Heritage Auctions in Dallas on Nov. 1, 2018. DALLAS, Texas — A bumper sticker from Wapakoneta, Ohio, advertising the city as the hometown of the "First Man to Step on the Moon" sold for $250. The vintage decal was one of the least expensive items to sell from the personal effects of astronaut Neil Armstrong at Heritage Auctions in Dallas, where the more than 700 lots that were offered as part of the Armstrong Family Collection brought in an astronomical $5.2 million in bids. At the opposite end from the bumper sticker — topping the sale's results at nearly half a million dollars — was a label of a different type. 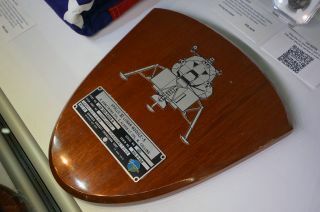 A metal spacecraft ID plate that landed on the moon with Armstrong and was presented to him post-flight sold for $468,500. "This was flown to the surface of the moon. This was there," said auctioneer Mike Sadler. "One of those signature lots in a signature sale. This is amazing." The plaque-mounted plate, which was one of three flown on board the Apollo 11 lunar module "Eagle" during the world's first piloted moon landing on July 20, 1969, opened at $110,000. After three minutes of back and forth bids, each raising the total by $10,000, one of about 20 bidders who attended the sale (out of the more than 2,449 who participated by phone, internet or in-person over the course of the auction) won it for $380,000 (the $468,500 sale price includes a 25 percent buyer's premium added by Heritage). "You have got yourself a plaque, my friend," said Sadler, congratulating the high bidder as others in the room applauded. The same buyer picked up another one of the highlights from the auction, a piece of a historic airplane that Armstrong carried with him to the moon. A bumper sticker promoting Wapakoneta, Ohio as the hometown of the "First Man to Step on the Moon" was one of the least expensive items to sell at Heritage Auctions' sale of the Neil Armstrong family collection on Nov. 1, 2018 in Dallas. "We're going from the Wright brothers in Kitty Hawk in 1903 and the thrill of that [first] successful powered flight, to walking on the moon, arguably the pinnacle of any kind of aviation achievement," said Sadler. In total, six pieces of the Wright Flyer flown on Apollo 11 were auctioned, including four samples of wing fabric and two fragments of the plane's wooden propeller. The 1-inch (2.5-centimeter) fabric artifacts sold for $112,500 to $175,000 each. The propeller shards each brought in $275,000, tying them with two other lots for the second highest bids for items from the Armstrong Family Collection. A 17.75-by-11.5-inch (45-by-29-centimeter) American flag, which Heritage said was the "largest size typically flown by Apollo missions," and a gold-colored medallion that Armstrong flew to honor the Apollo 1 astronauts who died in a 1967 fire on the launch pad each commanded $275,000 as well. The Apollo 11-flown Apollo 1 Fliteline medallion was among the lots that Mark and Rick Armstrong had designated for charitable donations. "It just seemed very natural for us to donate some of the proceeds from that to the Astronauts Memorial Foundation, which was formed after the Apollo 1 tragedy," said Mark in an interview with collectSPACE. "And there are many other examples like that." Other leading lots included an Apollo 11 crew-signed envelope ("cover") that was flown to the moon for $156,250, a silver Apollo 11 medallion minted by the Robbins Company that sold for $112,500 and two smaller U.S. flags also flown on Apollo 11 that were won for $106,250 each. Armstrong's Gemini-era flight suit, which may have been the first NASA garment that he wore as a member of the second astronaut class selected in 1962, sold for $109,375. Fragments of the Wright brothers' Flyer, the first powered aircraft to successfully fly, that were carried to the moon by Neil Armstrong on the Apollo 11 mission commanded some of the highest prices at Heritage Auctions' sale of the Armstrong Family Collection on Nov. 1, 2018. Julie Ahlers, who attended the sale, bid on and won the suit to place it on display at the Armstrong Air and Space Museum in Wapakoneta. Ahlers told the Houston Chronicle that "a piece of history like that should be viewed by everyone." Ahlers also won a copy of Newsweek magazine dated July 21, 1969, with Neil Armstrong on the cover and addressed to the astronaut's then-Texas home, for $11,875. A letter that Armstrong wrote as a young boy to the Easter bunny, which Heritage identified as a highlight prior to the sale, sold for only $4,000. Conversely, a crayon coloring of flowers from a first grade note to his mother did surprisingly well, selling for $15,000. The Armstrong Family Collection was included as part a larger three-day space exploration-themed auction that brought in a total of $7.4 million for Heritage. The Dallas firm will hold two more sales with items from Neil Armstrong's estate. Part Two is scheduled for May 9-10, 2019, with a third set for the following November. "Working with the family to share objects near and dear to Neil Armstrong with his fans and space memorabilia collectors is a shining point in the history of Heritage," said Greg Rohan, president of Heritage, in a statement. "We are excited for the spring, when we have the pleasure of bringing more never-before-seen artifacts and private mementos to the world."